Humans adapted to a pattern of walking that differs from that of most mammals. Instead of walking on their toes without putting much weight on the heel, they tend to walk by striking their heels first – in a strike known as heel-toe walking. Although running or walking on the toes is efficient for four-legged creatures, for humans a heel-toe pattern is most efficient. 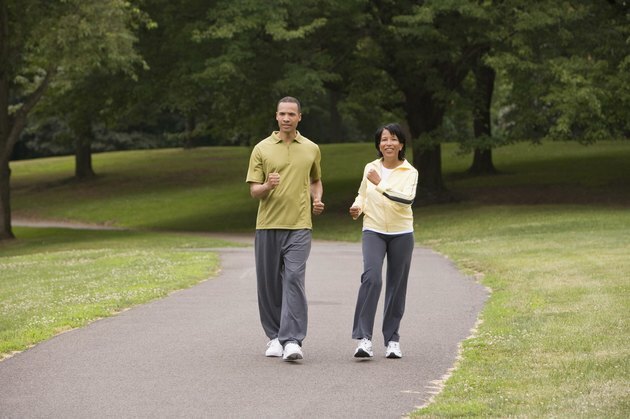 The way in which you walk affects which muscles are activated and your overall energy efficiency. Placing the toes first reduces the amount that your Achilles tendon must stretch when walking. Toe walking decreases the activation of the soleus muscle, which runs from just below the knee to the heel, by 122 percent, according to a study in the “Journal of Biomechanics” published in 2007, but increases the activity of the largest calf muscle, the gastrocnemius, by 76 percent. Researchers from Jean University in Germany and the University of Utah studied the efficiency of toe-to-heel movement versus heel-to-toe movement. Their research, published in the “Journal of Experimental Biology” in November 2009, found that walking with the toes first, with no heel strike, caused volunteers to expend 53 percent more energy. Tiptoeing is even less efficient. Toe-to-heel walking and heel-to-toe walking can be used as exercises for athletes, including runners, who are prone to muscular imbalances. These walking techniques strengthen the muscles of the calf, which helps protect you against shin splints and stress fractures. To work the muscles of the calf and stretch the Achilles tendon, you can add both types of walking two to three times per week to your exercise routine. For focused heel-to-toe walking, step forward in bare feet leading with your heels. Keep your body erect and barely let the toes touch down – if they touch at all. For toe-to-heel walking, also move in bare feet and focus on coming high onto your toes and then lowering the heel as close to the ground as possible without actually touching. Go about five feet, or 15 meters, rest for a minute or so, and then repeat. Toddlers often walk on their toes when first learning to walk. Over time, most toddlers outgrow this habit and walk heel to toe, but in some children the pattern becomes a habit or is due to a short Achilles tendon. It can also be caused by certain developmental disorders. If your child walks on his toes after reaching age 2, consult your physician.